At Davison, it’s all about finding “a better way.” Founder George Davison created his 9-step inventing method to help everyday idea people with a more efficient and affordable way to invent. However, it’s not just about creating things for the sake of creating things. It’s about finding solutions to problems. It’s about designing inventions and innovations that have the power to change lives. Finding “a better way” to change lives is really at the heart of what we do here at Davison. How can we help and how can we give back? During the end-of-year holiday season, this concept of “giving back” takes on an additional meaning. This holiday season, our very own founder, Mr. Davison, contributed to a notable community cause with a donation to Variety® – the Children’s Charity, which holds an annual Anniversary Gala in Pittsburgh each winter to raise funds to empower children with disabilities. Variety Chief Executive Officer Charles LaVallee was quick to express thanks to Mr. Davison for his support of the gala in an emotion-filled letter, which noted that all funds raised from the gala help provide equipment that has the power to give children with special needs the opportunity to participate in typical childhood experiences. 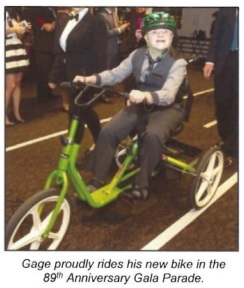 In particular, this year’s 89th Anniversary Gala included the “My Bike” parade, which highlights a Variety program that grants customized adaptive bikes to children with special needs. Tracy, the mother of a child who rode his innovative adaptive bike in the “My Bike” parade, explained what the end of year gift meant to her and her son, Gage. “When we went to get Gage fitted for his new bike, he was truly excited and felt safe and comfortable. It made my heart smile to watch him accomplish another milestone. He is so excited about receiving his bike. He has all these plans for going on bike rides with friends!” said Tracy. As we bring the holiday season and 2016 to a close, we encourage the innovators, inventors and everyday idea people of the world to find “a better way.” What can you do in your community? How can you give back? What can we create that makes life better for all? We hope to help you with all of your innovative and life-changing ideas in 2017.